Comedy, 1979 Dr. Shuki Chaftziva is a ballroom dancing instructor who tries his hand at match-making. Comedy, 1979 Dr. Shuki Chaftziva is a ballroom dancing instructor who tries his hand at match-making. He follows the obituaries and takes his client, Zigi Fuchsman, an auto mechanic and childhood friend, to comfort the mourners and check out the widow and her property. At the same time, Ben Gurion Shemesh, a grease monkey who wants to be a singer, tries to win the heart of Dina, the discotech's resident floozy and also, Zigi's daughter. 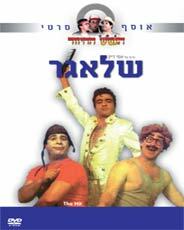 Starring: The Gashash Hachiver, Ofra Haza and others.